Study Objective: Study Objective: In this research paper, we demonstrate how to increase the success rate of laparoscopic surgery on pregnant patients with an ovarian cyst using rectal probe, SAND balloon, and lowering the insufficient level. Design: The study design wasa retrospective study. Setting: The study was conducted at Japanese Red Cross Kyoto Daini Hospital, Kyoto, Japan. Patients: Pregnant patients with an ovarian cyst who underwent laparoscopic surgeries at our institution during the period from January 2011 to December 2016. Materials and Methods: We reviewed 14 cases of pregnant women with ovarian cysts that underwent laparoscopic surgery during the study period by observing and analyzing the patient's characteristics, hospitalization practices, surgical complications, operational procedures, and obstetric outcomes. Main Results: Three cases were emergency surgeries and 11 cases were elective surgeries. In the 14 cases, the gestational age at the time of the surgeries ranged from 6 to 20 weeks. In our studies, we found no systemic complications after the surgery and none of the cases reported any fetal malformation or any fetal growth restriction. Conclusion: In our review, laparoscopic surgery for ovarian cyst during pregnancy was very safe and successful, without any adverse effects on pregnancy outcome. Pregnancies that are complicated by an ovarian cyst have an occurrence rate of about 1% among all pregnancies. Within that 1% bracket, only about 0.5%–1% of these pregnancies actually require surgery. Some pregnancies with a corpus luteum cyst have been documented to resolve naturally by themselves., However, other adnexal masses, such as serous cystadenoma and dermoid cyst, can persist and gradually enlarge and thereby cause complications during pregnancy. Pregnancies that require surgical procedures do carry the risk of some adverse fetal outcomes such as fetal loss, preterm delivery, and dysmaturity of the fetus. However, without the use of surgery, applying a more conservative management approach could result in other serious complications as well, such as torsion or the rupturing of the ovarian cysts.,, Currently, laparoscopy (a small invasive surgery) has become increasingly more common in pregnant women  since it involves little postoperative pain and causes no adverse impact on the overall obstetric outcome. The purpose of this study was to evaluate the successful obstetric outcomes of laparoscopic surgeries performed during the stages of early pregnancy at our institution between January 2011 and December 2016 and identify the various procedures and methods that were used before and during the laparoscopic surgeries that helped increase surgical success while minimizing the risk of complications associated with pregnancy. We retrospectively reviewed the dates of laparoscopic surgery of all pregnant patients who underwent the procedure in the past 5 years including reviewing and collecting all of the patient's medical records, postoperative hospitalization data, complications, pathological reports, and obstetric outcomes. We also assessed the preterm delivery, Apgar score, maternal outcomes, and surgical complications. Our study included the medical records of all 14 laparoscopic surgeries performed on pregnant patients with ovarian cyst at our institute, the Japanese Red Cross Kyoto Daini Hospital, in Japan, between January 2011 and December 2016. A total of 2926 deliveries were recorded between those years. For any laparoscopic surgery to be considered and initiated, certain criteria need to be met which include the following: (1) the type of symptoms that are present, (2) the size of the ovarian cyst should be larger than 6 cm, (3) if there are no spontaneous shrinkages by weeks 12–13 of the pregnancy, (4) if there are no threats that could lead the pregnant patient to premature labor or abortion, and (5) if there are no signs of malignant activities within the images. For simple cysts measuring between 6 and 10 cm, if patients remain asymptomatic and regular ultrasound scans show no change of cyst size, then we adopt a conservative approach. For other adnexal mass, although patients may be asymptomatic, if the size of the cyst is more than 6 cm, we recommend surgery. All laparoscopic surgeries are performed with CO2 insufflation levels at 8 mmHg and proper consent forms are obtained from the patient to proceed with the surgery during pregnancy. All cases included in this study are of patients who underwent laparoscopic surgery (either total laparoscopic surgery or laparoscopic-assisted surgery); except for one case, which was performed under aspiration. Total laparoscopic surgery is performed fully intracorporeally; on the other hand, laparoscopic-assisted surgery is a procedure that is performed largely laparoscopically and then completed through a small abdominal incision. Laparoscopic-assisted surgery maintains the positive minimally invasive attributes of laparoscopic surgery but may reduce the complexity of certain procedures by allowing challenging maneuvers to be performed outside the peritoneal cavity. Moreover, it reduces the potential for spillage of the contents of the ovarian cyst and the time of insufflation usage which eventually reduce the adverse effects on the fetus. For cases where the ovarian cyst is underneath the Douglas pouch, instruments such as the SAND balloon catheter™ (Hakko Medical, Tokyo, Japan) [Figure 1] and the rectal probe (Hakko Medical, Tokyo, Japan) [Figure 2] are used to bring the ovarian cyst out into the open working space. The SAND balloon catheter™ is a disposable, single-use, sterile device that consists of two balloons and a needle to puncture a cyst with its tip. After puncturing the cyst, the first balloon to inflate is the distal balloon, followed by the proximal balloon. The punctured cyst wall is then sandwiched between the two inflated balloons, thus minimizing and preventing spillage into the peritoneal cavity while decompressing the cyst. As the cyst gets decompressed, the ovary can be pulled toward the abdominal wall and the cyst can be extracted out from the incision. The rectal probe's full length measures 36 cm and it's spherical part is inserted in the posterior vaginal fornix. We can use it to push up and move the cyst that is underneath the Douglas pouch out into the open working area. All demographic data, admission and discharge notes, and operative notes were reviewed. The collected data included patients' age, gestational age, duration of symptoms, operative time, insufflation time, the size and pathology of the ovarian cyst, the length of postoperative hospital stay as well as any postoperative complications. Each of these patients who delivered at our institution had continuous follow-ups, up until their delivery. 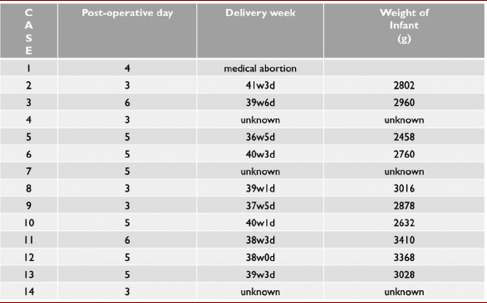 In the 5-year span between January 2011 and December 2016, 14 cases of benign ovarian cyst were operated on during pregnancy [Table 1]. Out of these, one patient had aspiration; laparoscopic-assisted surgery was carried out in ten cases, while three underwent total laparoscopic surgery. The age of all these women diagnosed with benign ovarian cyst ranged from 23 to 35 years of age, while the average age of patients was found to be 29. Most of the patients were first diagnosed in the first trimester of their pregnancy at the time of the obstetric ultrasound. Three patients presented with acute abdominal pain and underwent emergency laparotomy. The rest of the pregnant patients had elective surgery in subsequent weeks following the diagnosis. Among the 11 cases of elective surgery, the gestational age ranged from 13 weeks and 3 days to 16 weeks and 3 days. Among the three emergency surgeries, two patients were operated on during the first trimester at 6 and 7 weeks, while one patient was operated on during the second trimester at 20 weeks. In two of these cases, the cyst was detected in the ovarian torsion. In all emergency cases, the cysts were diagnosed during ultrasound scans done earlier. Case 1 was planning to go for a surgery later on; unfortunately, the cyst torsion happened earlier. Case 2 and 3 were diagnosed and followed up at another institute but carried to our hospital for the emergency surgery. For case 3, the size of the ovarian cyst was first diagnosed to be 4 cm and managed conservatively at the other institutes; however, it was measured to be 8 cm in size when the emergent surgery occurred at our institute. Based on the findings, no need was observed to convert from laparoscopic surgery to laparotomy. The size of the cysts varied from 7 cm to 11 cm, and the average size of the cysts was 8.7 cm (>5–10 cm in 12 cases and >10 cm in two cases). The ovarian cysts were unilateral for all cases; nine on the right side and five on the left side. As for the type of surgeries, ten patients had ovarian cystectomies, three had salpingo-oophorectomies, and one had aspirations. Cyst aspiration is associated with a higher recurrence rate since the cyst lining remains intact, thus, we mostly do not perform it; however, in case 2, because the cyst was suspected to be a corpus luteum cyst, the torsion was released and only aspiration was performed. For ovarian cystectomies, seven out of ten cases underwent laparoscopic-assisted surgery. We prefer performing laparoscopic-assisted surgery over total laparoscopic surgery for pregnancy-related cases since laparoscopic-assisted surgery can effectively shorten the time of insufflation usage. The only reason for carrying out total laparoscopy surgery for the three of the cases was the short length of the ovarian ligament which makes the extraction of the ovarian cyst difficult. Three patients preferred the salpingo-oophorectomy procedure over cystectomy as it is known to shorten the length of surgery. The intra-abdominal pressure was set below 8 mmHg in all cases, and none of the patients reported any operation-related difficulties or postoperative complications. The average blood loss was 22 g. The average surgical time was 95 min (ranging between 38 min to 154 min) and the average insufflation time was 34 min (ranging from 5 min to 66 min). There is a time gap, especially for LAC (laparoscopic-assisted cystectomy) and LA-SO (Laparoscopic-assisted salpingo-oophorectomy), between the surgical time and the insufflation time since we stop the use of CO2 insufflation during the extraction of the cyst performed outside the peritoneal cavity. The average postoperative length of stay was around 4 days. There were no procedural or systemic-related complications after the surgery. Pathological features of the ovarian cysts included ten mature cystic teratoma, one mucinous cystadenoma, one corpus lutein cyst, and two serous cystadenoma. Magnetic resonance imaging (MRI) images were obtained in all 14 cases to ensure that there were no signs of malignant activity, and even the pathological results showed only benign activity. Pregnancy outcome results were analyzed in [Table 2]. Among the enlisted cases, case number 3 and 12 received prophylactic tocolysis during the postoperative period to prevent uterine contractions. In both these cases, there were no signs of preterm delivery and tocolysis ended by the date of patient's discharge from our institute while the pregnancies progressed to term. Although there were no signs of premature labor throughout the follow-up for case 5, it turned out to be the only preterm delivery case with the delivery occurring at 36 weeks and 5 days. For case 1, which was an emergency case, the patient was unaware of the pregnancy until after the examination revealed an ovarian torsion. The patient decided to have a medical abortion after the surgery, even though the reason for the abortion was unrelated to the surgery that occurred during the pregnancy. The delivery method for all the 14 documented births was normal vaginal delivery, except for one, which was a cesarean section that had to be carried out due to the breech presentation. There were no signs of any fetal distress or fetal complications. No other major fetal malformations were observed. From the laparoscopic surgeries performed on pregnant patients at our institution, we have come up with some ideas and strategies on how to increase the success rate of the surgery while minimizing the risk of fetus complications during pregnancy. These aspects include the timing of the surgery, the lowering of insufflation levels, implementing the use of laparoscopic-assisted surgery, bed rotation, and using instruments such as SAND balloon catheter™ and rectal probe, and Rectal Sonde™. Since there was not control group to compare these strategies, there are limitations in our findings. When comparing the surgery performed during organogenesis and the other performed during the early second trimester, there were not any significant differences in terms of the surgery time, insufflation time, and blood loss, indicating that the technical difficulties of performing laparoscopic surgery during the first trimester and those performed during early second trimester showed little differences. No fetal distress, complications, or fetal malformations were observed in any of the cases. Therefore, we recommend that the best time to do elective laparoscopic surgery is during the early stages of the second trimester when the fetus is more developed and the timing for a spontaneous resolution and the risk of abortion is over. However, the stage of the pregnancy should not be considered for performing the surgery in emergency cases. Only one emergency case was performed at our institution wherein the patient was in the middle of the second trimester at 20 weeks, and tocolysis was administered surgery as a preliminary caution to help prevent uterine contractions up until the discharge date. However, no tocolysis was required to be administered between the date of discharge and the delivery. Performing laparoscopic surgeries at the lowest insufflation level possible can minimize fetal risk. The concern is that high insufflation levels over a prolonged period of time could bring the fetus into acidosis. Some studies suggest that 10–15 mmHg of carbon dioxide insufflation is primarily safe for the fetus. Other studies have reported that insufflation of <12 mmHg may not provide adequate visualization of the intra-abdominal cavity. In our institute, we set CO2 insufflation levels at 10 mmHg for nonpregnant patients. For all pregnant patients in our case study, we used insufflation of 7–8 mmHg, which is much lower than the suggested insufflation levels to ensure adequate venous return, which helps minimize pressure on the inferior vena cava and prevent fetal acidosis. No surgical difficulties were reported, not even for the patient whose surgery was performed at 20 weeks of gestation. Thus, we believe that insufflation levels at 7–8 mmHg is capable of performing surgeries without any difficulties, thereby reducing the risk even more to the fetus. Laparoscopic-assisted surgery was conducted in ten of our cases. Since the uterus is larger when compared to the distance between the umbilical port and the ovarian ligament, using laparoscopic-assisted surgery makes the extraction of the ovarian cyst through the umbilical port easier. We can perform the extraction of the cyst with the laparoscopic extracorporeal oophorectomy once the ovarian cyst is placed near the umbilical port. At this point, we can stop the use of CO2 insufflation, thereby leading to a shorter period of insufflation usage and reduced adverse effects on the fetus. Bed rotation was a strategy we found to be quite helpful at times. By rotating the bed, we could sometimes lead the ovarian cyst closer to the first port, making the extraction easier. However, because positional changes can create some technical issues, any positional changes were gently modified with close communications with the anesthesiologist. The SAND balloon catheter™ and the rectal probe were two instruments that proved to be very useful in some of the cases. Bringing the ovarian cyst out into the open working space has been noted to be somewhat difficult since no instruments can be introduced vaginally into the uterus or applied to fix the cervix (such as in the case of a regular, nonpregnant uterus). To counter this problem, the rectal probe or the SAND. balloon catheter™ can be used to help facilitate the exposure of the ovarian cyst onto the open workspace. These two instruments are especially useful in exposing the ovarian cyst that is located underneath the Douglas pouch. Some mature cystic teratoma can contain bones and can be potentially dangerous; therefore, SAND balloon catheter™ has been used cautiously in Japan. An unfortunate incident was earlier reported where bones were present within a mature cystic teratoma, and the cyst was punctured by the SAND balloon catheter™ leading to the breakage of the balloon which spilled its fluid contents into the abdominal cavity. We can identify cysts that contain bones and prevent such incidents from occurring as our current practice involves obtaining a MRI for all cases before considering surgery. Therefore, we believe that the use of SAND balloon catheter™ can still be an effective method of extracting ovarian cysts in pregnant patients. However, before pursuing the SAND balloon catheter™, patient's consent is taken after educating them about the usage and potential dangers associated with the balloon catheters. The role of MRI in the diagnostic management of pregnant women has been proved to be safe and has demonstrated high sensitivity. SAGES states that MRI without the use of intravenous gadolinium can be performed at any stage of pregnancy. In our institute, except for emergency cases, we take MRI image only after 12 weeks to avoid organogenesis. In summary, based on our reviews, observations, and research, laparoscopic surgery was found to be a very safe surgical approach for pregnant patients. However, that being said, the success rate of laparoscopic surgery during pregnancy can be further enhanced while the risk of fetus complications can effectively be reduced with the suggested approaches and ideas mentioned in this paper. I (Koki Kurihara) would like to thank Mari Minagawa, Masamune Masuda, Mari Fukuyama, Aya Yamamoto, Seiko Kato, Hiroyuki Fujita, and Miho Eto, Department of Obstetrics and Gynecology, Kyoto Red Cross Hospital Daini, Kyoto, Japan and Keiko Tanigaki, Department of Obstetrics and Gynecology, Gifushimin Hospital, Gifu, Japan, for their support. Kusakari T, Sumida N, Suzuki S. Evaluation of laparoscopic surgery for adnexal masses in pregnancy. Jsgoe 2012;28:627-32. Kasai M, Koh B, Hanabusa K, Nakamura T. Fetal effects of laparoscopic surgery during pregnancy. Jsgoe 2015;30:391-5. Ding D, Chang Y. Laparoendoscopic single-site surgical cystectomy of a twisted ovarian dermoid cyst during early pregnancy: A case report and literature review. Gynecol Minim Invasive Ther 2016;5:173-7. Tsai H, Chen C, Wang P, Yang M, Twu N, Yen M, et al. Single-port laparoscopic ovarian cystectomy of teratoma during pregnancy. Gynecol Minim Invasive Ther 2013;2:137-9.
de Bakker JK, Dijksman LM, Donkervoort SC. Safety and outcome of general surgical open and laparoscopic procedures during pregnancy. Surg Endosc 2011;25:1574-8. Agarwal N, Parul, Kriplani A, Bhatla N, Gupta A. Management and outcome of pregnancies complicated with adnexal masses. Arch Gynecol Obstet 2003;267:148-52. Weiner E, Mizrachi Y, Keidar R, Kerner R, Golan A, Sagiv R, et al. Laparoscopic surgery performed in advanced pregnancy compared to early pregnancy. Arch Gynecol Obstet 2015;292:1063-8. Lee JH, Lee JR, Jee BC, Suh CS, Kim SH. Safety and feasibility of a single-port laparoscopic adnexal surgery during pregnancy. J Minim Invasive Gynecol 2013;20:864-70. Chung MK, Chung RP. Laparoscopic extracorporeal oophorectomy and ovarian cystectomy in second trimester pregnant obese patients. JSLS 2001;5:273-7. Lachman E, Schienfeld A, Voss E, Gino G, Boldes R, Levine S, et al. Pregnancy and laparoscopic surgery. J Am Assoc Gynecol Laparosc 1999;6:347-51. Buser KB. 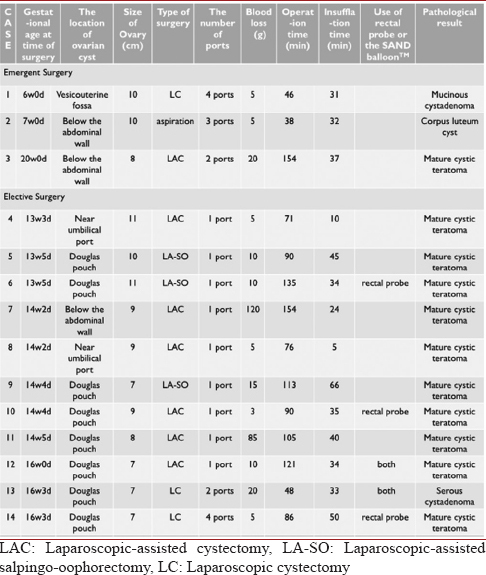 Laparoscopic surgery in the pregnant patient: Results and recommendations. JSLS 2009;13:32-5. Corneille MG, Gallup TM, Bening T, Wolf SE, Brougher C, Myers JG, et al. The use of laparoscopic surgery in pregnancy: Evaluation of safety and efficacy. Am J Surg 2010;200:363-7. Koo Y, Park J, Kim D, Kim J, Kim Y, Kim Y, et al. Laparoscopic versus open surgery for adnexal tumor in pregnant women. Gynecol Minim Invasive Ther 2013;10:57-60. Ghazali W, Shukri N, Halim N. Laparoscopic cystectomy in pregnancy, a viable solution – A 14 years series. Gynecol Minim Invasive Ther 2017;6:1-5.